The tvONE C3-540 CORIOmaster offers an efficient approach to building video display arrays. tvONE is showing the C3-540 at NAB throughout this week. The C3-540 CORIOmaster Video Wall Processor. tvONE’s CORIO3 technology gives designers and users access to unexplored realms of video processing power. 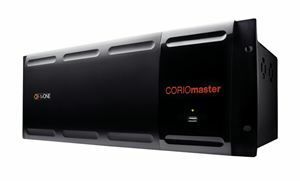 Using presets and API instructions, CORIOmaster and CORIOmaster mini can deliver real-time, full-motion window transitions.CORIO3 video processing technology makes the designing of creative and powerful video display systems an entirely visual experience. Users create layouts or virtual display groups on a PC screen and then select sources to show on those virtual displays. Then it’s a freeform process of creating a canvas over the display layout by sizing, shaping, rotating, and positioning each source as required.